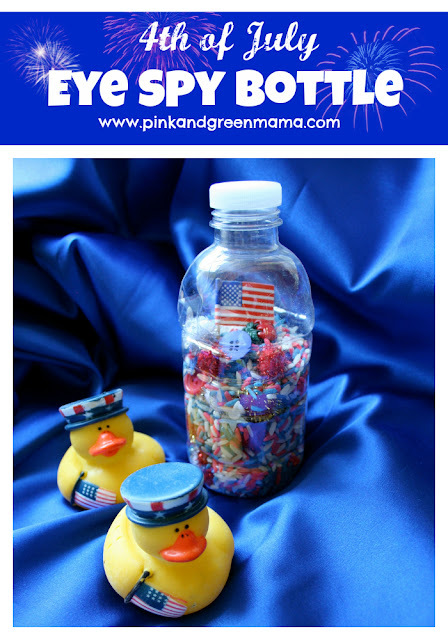 the girls and I decided to make a Patriotic Eye Spy Bottle! We started by dyeing some rice blue and red. and a few pumps of alcohol based hand sanitizer. with a few pumps of alcohol-based hand sanitizer massaged in to cure the color. I had to use quite a bit of food coloring the get the colors so bright. Then, we let it dry on a paper towel on a shallow dish. For the "White" rice we just left the rice plain. The rice dries pretty quickly because of the Purelle. I would say dry in 10-15 minutes. Red, White, and Blue Buttons, Beads, Pom-Poms, Coins, a Mini Flag, etc.